Generally, MoveRoll Horizontal Conveyor makes ramps or slopes for moving paper or board rolls in rolling motion superfluous. Mounted on even ground, the conveyor’s pressure elements transport rolls safely and smoothly in controlled fashion. However, many paper mills, years ago, decided to go for a finishing area layout, that includes sloped floors and ramps for roll transport. For logistical and cost-efficiency reasons it is not always possible for paper mills to level the floor or to get rid of old ramp constructions. We have developed MoveRoll Ramp Conveyor to make roll handling in such situations safer and more efficient. 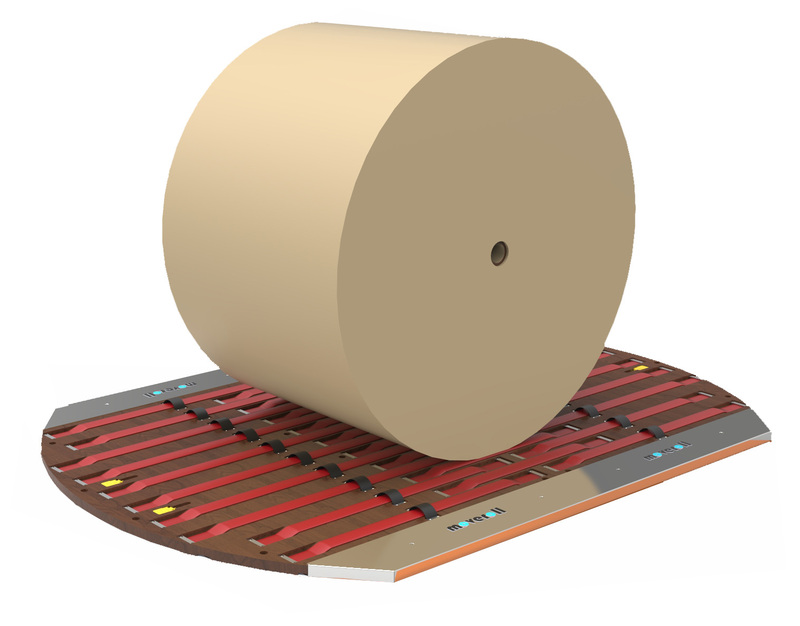 The paper roll conveyor modules use standard pressure elements to transport rolls gently and safely in rolling motion. During the whole transport process, the pressure elements control the motion and speed of the rolls. Since the conveyor modules do not have mechanical parts, the maintenance requirements are very low. The conveying process does not require receivers. In addition, kickers are only needed for getting rolls onto the conveyor, not for generating roll speed. Traditionally, roll motion on ramps is generated mechanically or gravitationally. Hence, roll motion and roll speed are fast and uncontrolled. Often, paper mills have included steel stops or pneumatic stoppers in their ramps. These devices are usually energy – and/or maintenance intensive. When rolls collide with such stops and stoppers, they often bounce back and force heavily. Consequently, common problems of roll handling on ramps are work safety issues, paper roll damages, and high energy and maintenance expenses. MoveRoll Ramp Conveyor transports rolls smoothly uphill on inclines of up to 10 mm/m and downhill on declines of up to 30 mm/m. Like the horizontal conveyor, Ramp Conveyor is flat and has a modular built. It is possible to install the conveyor modules directly on the floor or on top of existing constructions. The pressure elements keep control of a roll’s rolling motion. Consequently, heavy collisions with metal stops do not occur. 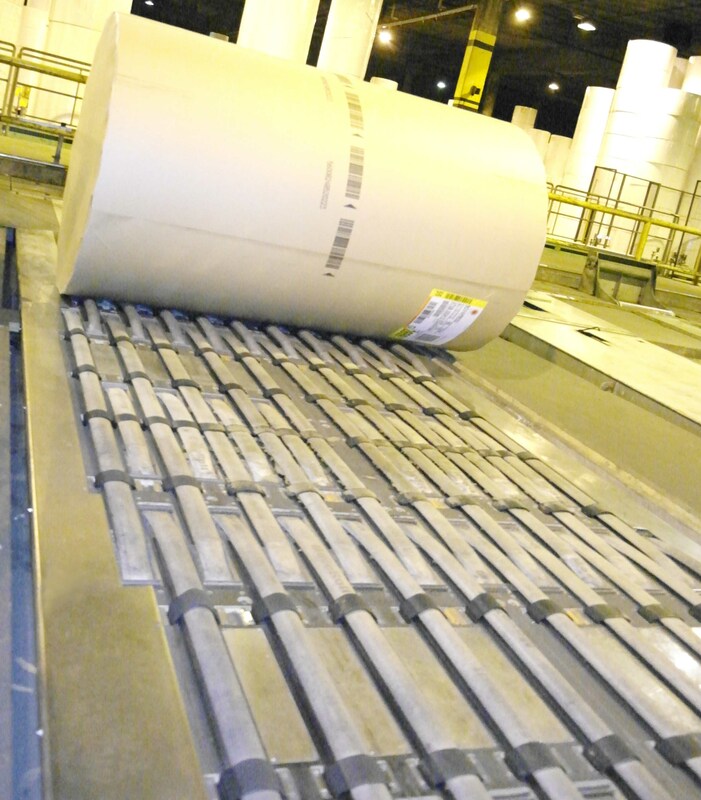 The most significant advantages of MoveRoll Ramp Conveyor are gentle material handling on ramps, increased production efficiency, and improved work safety. For more technicaal information about MoveRoll Turntable Module you can download our datasheet from the button below. We have developed a conveyor module that is especially meant for roll turning applications. 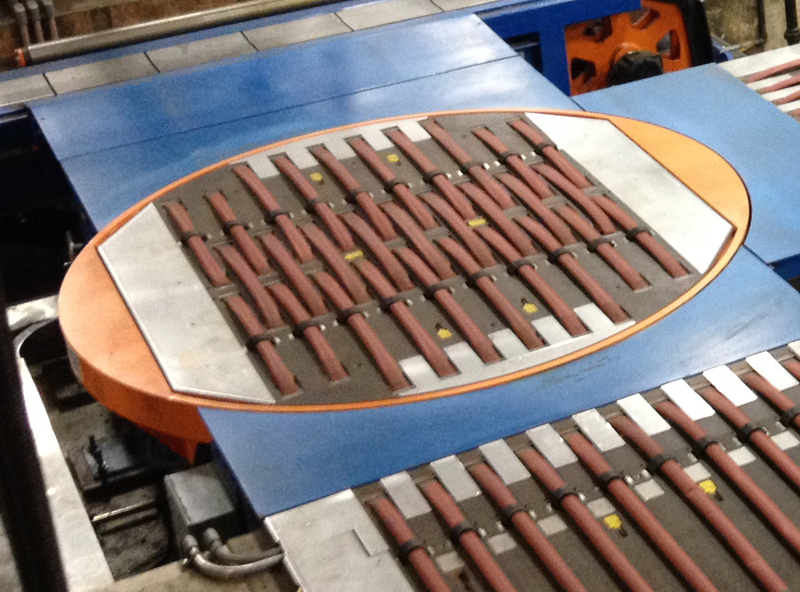 During the turning process, MoveRoll Turntable Module centralizes a roll on the turntable and drives it onto the next conveyor. Due to the smart design, the module is compatible with a broad range of turning units. The installation of a Turntable Module on a turning unit reduces the amount of mechanical parts. For example, the process does not require kickers or receivers. Depending on the turning unit, the module enables roll transport into more than one direction. The working principle is very simple: Once a roll has moved onto the pressure elements of the Turntable Module, the pressure elements safely lock the roll on the module’s center. The roll does not move until the turning process is complete. Thereafter, the pressure elements unlock the roll and its journey continues – initiated by the compressed air in the pressure elements.